World No. 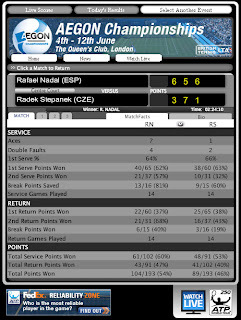 1 Rafael Nadal quite literally slipped up in the second set of his 6-3, 5-7, 6-1 win over Radek Stepanek on Thursday evening at the AEGON Championships.He faces Jo-Wilfried Tsonga in the quarterfinals. 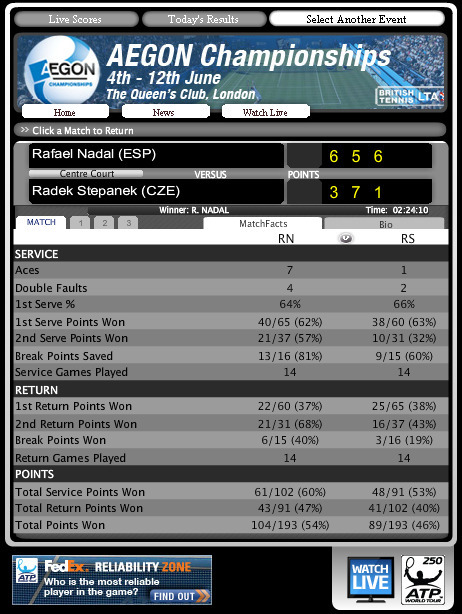 Happily for Nadal fans, with Pippa Middleton and Princess Beatrice among those watching on, the Mallorcan was helped to his feet by the concerned Stepanek and, despite losing the second set, recovered to stroll to victory in a comfortable third set. Rafa/Marc Doubles match has been suspended due to darkness after losing the first set in a tie-break.